The income statement seems straightforward enough: revenue at the top, expenses in the middle and profit at the bottom, right? Sadly, the good old profit-and-loss gets botched more than just about any other financial statement. If you’re running your own business, it’s important to know what goes where. And if you’d ever like to buy or sell a store, it’s even more important to understand what goes on an income statement and how the statement should be structured so you can spot financial shenanigans and not overpay for a business. 1) An income statement always represents a period of time like a month, quarter or a year. This contrasts with a balance sheet, which shows account balances for one exact date. The income statement above shows five full calendar years plus a last twelve months (LTM) period as of 9/30/13. 2) Income statements can be generated using the cash or accrual accounting method. Cash accounting means you calculate your profits (or loss) based on when the income and expenses hit your bank accounts. Accrual accounting computes your income based on when a sale was actually made regardless of payment. So if you made a sale in January but don’t receive the funds until February, the revenue will show up in your January income statement with accrual accounting. Accrual accounting is the most accurate, but it can be a big headache to do properly. That’s why the majority of smaller independent merchants opt for cash-based accounting. Gross profit is the profit remaining after paying your direct product costs but before paying for your overhead and general expenses. So for the Parachute Palace, it’s the profit Phil generated after paying for the wholesale cost of the parachute he sold. The wholesale cost of the parachutes is referred to in accounting lingo as the Cost of Good Sold. If you want to really geek out and impress some CPAs, you can even shorten it to COGS, a term you may have seen before. When calculating gross profit, it’s also important to consider any other expenses directly related to selling the product. For an eCommerce merchant, one obvious expense is credit card processing fees. These fees are a direct result of each sale and need to be incorporated into the gross profit. Overhead includes all expenses that can’t be directly related to building/buying a product but are required to run the business: things like internet, web hosting, salaries, office suppliers and mini office basketball hoops. It all gets lumped in there. Most of the line items are self-explanatory with the exception of depreciation. When you make a large purchase that will be used in the business over the course of many years – like a fleet of cars – you don’t claim the entire cost as an expense the first year. Instead, you write off a portion of the cost, called depreciation, each year. Depreciation helps companies spread out the cost of large purchases over an extended time period to match the expense of the asset to its useful life. Phil drop ships all of his parachutes and doesn’t have any large purchases to depreciate, so his depreciation expenses are zero. The reality is that most independent eCommerce merchants won’t have any depreciation expense. Even those with larger purchases they could depreciate may choose to expense them all in one year due to IRS Section 179, which allows for up to a $500,000 exception – at least in 2013. But it’s a good concept to know and understand regardless. Our last section – calculating total income – takes into account how all the non-core aspects of the business impact the bottom line. 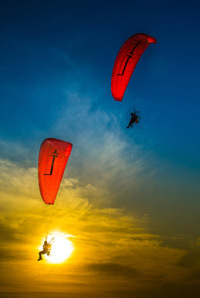 Interest Expense – Phil took out a loan to start selling his parachutes, so he’s incurred an interest charge each year. 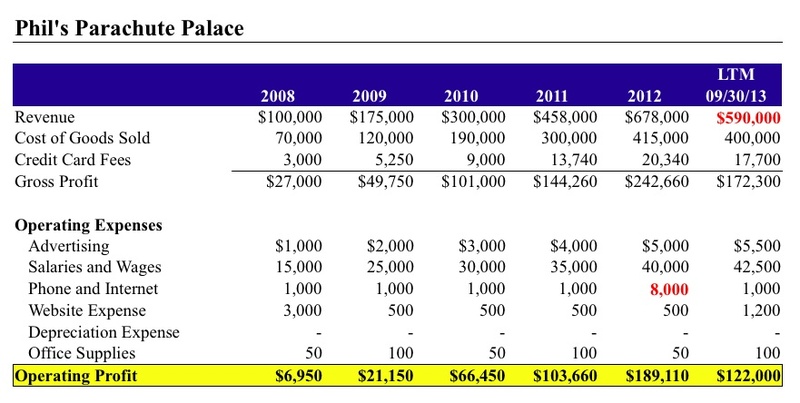 But interest isn’t included in the operating expenses because it’s not a core expense of running the business. It’s related to how the business is financed, but doesn’t have any impact on the business’s ability to generate income. If the business was purchased by someone else, those financing and interest expenses wouldn’t be there; they’d be different based on new financing or nonexistent if the new owner bought the business outright. So we want to isolate them, as they’re not related to the core operations. Interest Income – For similar reasons, we want to exclude any interest income the business is generating. Most business are purchased on a cash-free/debt-free basis, which means a a sold business won’t have excess cash or debt attached to it. An owner would pay off his loan before transferring the business and would withdraw any excess cash deposits before completing the sale. So if a business is generating a lot of interest income from excess deposits (not likely, thanks Ben! ), it doesn’t make sense to count those earnings in the operating income. A new owner wouldn’t expect to get those same interest payments as the cash hoard generating them probably wouldn’t be included in the sale. Non-Recurring Expenses – Also along the same lines, we want to strip out any unusual profits or expenses from our operating income, which is why we include them in this section. Ultimately, this section isolates non-operational costs from the operational income. Because companies are valued on a multiple of their core operating earnings, getting these expenses categorized correctly can help you get a lot more for your business when selling or prevent you from overpaying when buying. The final line item before net income is income taxes. Taxes are an inevitable aspect of life and business, but you’ll almost never see them on an income statement for an independent eCommerce business. Why? Because most independent eCommerce entrepreneurs (in the US, at least) will be set up as an LLC or an S-Corp, where business income flows through to the owner’s personal income statement to be taxed. These tax rates will vary widely from person to person, so it doesn’t make sense to include those figures along with the business financials. If you’re ever considering buying a company, the due diligence process – that is, digging into the financial and bank records to make sure everything looks legitimate – is always an involved process. But there’s a lot you can learn just by quickly glancing over an income statement. The biggest thing you want to look for is established trends that have been broken. For example, in Phil’s books below the spike in phone and internet expenses from $1,000 per year to $8,000 per year stands out like a sore thumb. Also, I’d be very curious to know why after five years of consistent growth, revenues from the last twelve months (LTM) dropped significantly. Gross Margin = Gross Profit / Revenues. This metric will give you a sense of how well a company is controlling direct costs. If the number is constant or steadily increasing over time, that’s a great sign. But if it drops, make sure you understand why. Operating Margin = Operating Profit / Revenue. Possibly the most important margin for the business, it tells how well a company is controlling all of its costs including overhead. It’s possible for a business to increase profits while its operating margin deteriorates simply by growing revenues quickly enough. Without examining the operating margin, you’d never know something was amiss. So what are the most important takeaways? Make sure variable costs are always incorporated into the gross profit. Strip out any interest or non-recurring expenses from operating income. And make sure to look for unusual trends and changes in gross and operating margin to spot red flags. Next time I’ll be tackling an even more misunderstood financial document: the balance sheet! Until then, I’m happy to answer any questions in the comments below. 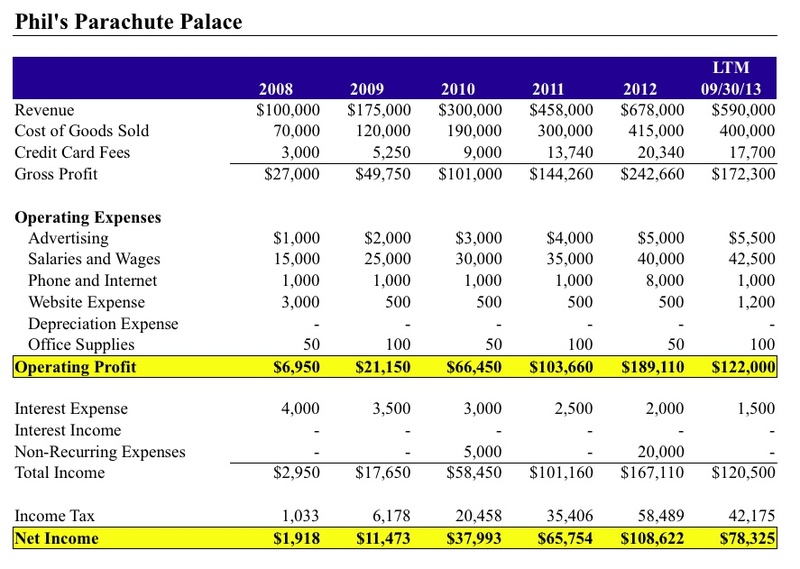 Great primer on an income statement. Being a finance guy as well, I definitely prefer accrual accounting because it tell me the “performance” of my business. Even though it’s a little trickier to do accrual accounting, it’s a level of visibility into my business I’m just not willing to give up! Cash accounting can be very misleading as to the health of your operation. Even more important in my mind, especially if you’re buying a company or planning to ever sell yours, is consistency. Being able to spot trends & identify areas of opportunity is nearly impossible if the books and accounting systems change every few months! Thanks, Andrew! I’m happy to see some education for business owners that brings it down to an understandable level. Thanks Patrick! 100% agree about accrual being more accurate, but sometimes it’s just not worth the trade-off IF the difference between cash and accrual results aren’t too large. For example, historically I have been doing accrual accounting to match up revenues and expenses in the same month as it is most accurate. But this takes me days each quarter, and sometimes I’ll put off accounting for months because I don’t have time to get to it. With a cash basis, because the issues that cause the problems are consistent from month to month (revenues always take 3 days to hit the bank account), the figures may be slightly off but the run-over from the previous month will also offset them. So with cash, I’ll get a result that is with 5% of accuracy (more or less) with 80% less work. So I think you need to weigh the trade-offs. For businesses with a lot of lumpy revenues I think cash accounting would be much harder to make a case for. This was just the right amount of information for me to get a basic understanding of a P&L statement, something I’ve been wondering about. Thanks for putting it in layman’s terms. I’m giving Xero a try, and it even integrates with a lot of shopping carts. That + trusty, inexpensive bookkeeper (way easier said than done!) = a lot less accounting for me! I’ve been working with a Xero specialist book keeper who is reasonable and has been great so far. If you’d like their name, feel free to email me via my contact page. I would like the name of the Xero specialist. Can you email to me? My email is marykirkpatrick@rocketmail.com. Hope it is OK to post that. Haha, love it! Great post Andrew. =) Bringing out the spreadsheets! Question: where do you usually put shipping fees? Thanks JP! Shipping fees would go into Cost of Good Sold. Sometimes you’ll see them broke out as a separate line item under COGS, but I didn’t just to keep things simple. Just didn’t want to confuse anyone 🙂 Keep up the good work man! HA… that’s right, I always forget the -1! Thanks man! Thanks for the refresher! Tons of great info packed into a succinct lesson. Glad you enjoyed it, Chris! Just chewing over depreciation and wondering if that too might be moved out of operational # and into the final section when looking at selling the business? In the offline world depreciation would like include the car fleet, office fit out, machinery, etc. Whereas in an online business the asset being depreciated is probably likely to be something smaller and more personal (my car, fit out my home office, etc) and this asset will not be transferred to the new owner. I’m guessing that transferable depreciating assets would remain in the operating section and non-transferable depreciating assets would move to the total income section to exclude them from the business financials? Good point / question, Sally. I think that’s probably a good way to look at it. Anything needed to run the business (an asset that would be transferred with the business) would be included in operating expenses, while anything that would remain with you after a sale (and might be a one-time purchase or something non-essential) could potentially be moved below the operating line. One question I would love to see covered in this series of posts is how to value your online business and how to increase the value of your online business. What can we do to make our businesses appeal more and have more value to potential purchasers? I stupidly created operations manuals for every process (as you might in an offline business) but technology being what it is, every time I press the ‘save’ button on my documented processes, one or more of my systems gets updated and my screen shots and processes are all suddenly out of date! Now, I favour including a package of one to one coaching with the new owner and providing support for a pre-determined amount of time, rather than going insane trying to keep my manuals up-to-date! Nice primer. Very useful Andrew. The Contribution Margin (CM) allows you to see just how much money is available to cover fixed expenses and lends itself to easily calculating break-even. Also, calculating a CM Ratio = CM/Sales is helpful when you want to know how much each dollar of revenue is contributing towards fixed expenses and profit. Have heard of the format, but not super familiar with it. But based on your example, it seems to follow the same format as the income statement I outlined above – with the gross profit being called contribution margin. Is there an aspect I’m missing? Great post Andrew. Quick question, in the example above COGS is circa 60-70% of revenue. My wife has an e-commerce store that is starting to do well in the fashion niche but we struggle with how much stock we should buy each month (can’t drop ship in her industry I’m afraid). Do you have any ratios for COGS as a percentage of revenue or profit that you look for in healthy businesses? While you can look at COGS as a % of revenue, probably the easier way to look at it is gross margin. That is, the percent of profit you have left over after paying direct costs. And that gross margin % will vary widely from industry to industry – so there’s really no rule of thumb. That being said, most drop shipping businesses will have gross margins in the 10% to 30% range. If you’re buying fashion products and stocking them yourself, I’d want to see margins definitely higher than that. Definitely somewhere in the 50% and up range. It’s great to see a post on how to crunch numbers. I’m personally terrible at this, and my accountant is always in for a surprise every year she sees my sheets. Hopefully I’ll start doing a better job of that. I did notice someone commented about bringing all the credit card bills and other expenses into one place – I have that problem too. Most of my expenses are charged on my card, and my autopayment doesn’t pay off the entire balance every month. So some months, my sheets would say one thing and my bank balance would say another. Have you had a similar problem? Great post Andrew, Love how you have broken down the income statement into its components. We provide tutoring and so this is geared towards students dealing with financial statements for the first time. That shouldn’t be a problem in terms of an accurate income statement and balance sheet. In terms of the income statement, you should be pulling expenses when they are incurred (even under cash accounting, or at least I do), so when they hit your credit card statement is when you’d list them on your income statement. From a balance sheet perspective, you’d list the outstanding balance of your credit card under the liabilities section, so this would also appear on the books. Then, when you made payment to it, you’d simply reduce the cash balance (from the assets section) as well as the card balance (from the liabilities). Andrew I may be blind 🙂 but I don’t see where you listed the calculation for “Revenue Growth” at the very end of the article? I am very green to QBs and wanted to know when I run the standard P&L, can the income show a breakdown of payments received in cash, credit cards and checks? Someone said it was as simple as double clicking on the subtotal. Would I have to customize the report and add that in some way? Thanks for any insight. Was wondering about having advertising and PR costs as part of Cost Of Goods Sold. In your example above, advertising comes under operating expenses. Here is my reasoning….Say you have an e-commerce website and do not hold any inventory therefore you depend solely on advertising to make sales. In this case can you then have advertising and PR costs as part of C.O.G.S or as part of operating expenses? Thanks!! This article is very helpful, thank you! I do have one additional question though. If a company takes out a $100,000 loan when they start the business, would that $100,000 be listed as revenue on the initial income statement and the loan payment amount (not interest) would be listed under operating expenses or on a balance sheet)? What are you including under “website expense”, it’s definitely more than the hosting costs. I’m trying to figure out where to put in an expense like paying companies to do things: SEO, uploading products, etc. Please advise.